Sometimes, somebody does a web site listing protests against the cuts so you don’t have to. Odd thought, working on NetworkX visualisations of lobbying activity. So much of whether the finished image is any use or not is an aesthetic decision, nothing to do with the actual graph metrics in any formal or programmatic way. Randomly fiddle with the scaling factor, or increase the multiplier you apply to the nodes’ link degree, and things look different – and possibly better. Also, more information may not be better – I can’t help but think it was a lot easier to derive conclusions before I gave the various ministries node weights to reflect their relative power and divided the ministry weighting on each link by the number of organisations taking part in the meeting, which should be an improvement. Also, after sweating quite a bit over this, does anyone know if NetworkX even lets you position nodes using polar coordinates? This looks useful. This is far from ideal, but it should give some idea. 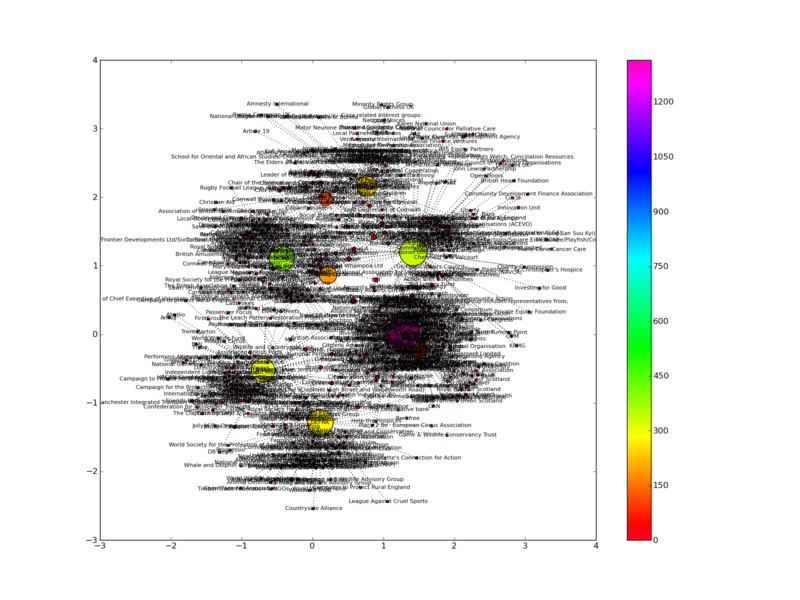 This one is using the standard force-directed spring layout and just the data I have from June, with the nodes coloured by their degree in the chart and sized by their meeting count. Downing Street (the large purple plook) is fixed in place and the others adjusted. I rather like the fact that the lobbyists look like bacteria swarming into a cell, or possibly sperm trying to fertilise David Cameron. In the last month or so I’ve begun adding blogs to my RSS queue again. I’m surprised by this; I didn’t expect to find that the form still had so much energy. Perhaps this isn’t so optimistic after all. Meanwhile, watch this space. I wrote about this piece about brewing beer in southern Sudan, and incidentally creating a power station and a water works and a tiny industrial working class. their proposed solution involved installing a brewery aboard a ship, so it could sail to wherever the thirsty masses had pitched up. Interestingly, as the story was released through the Grauniad’s “Guardian Professional” advertorial division, this is also something SABMiller management was willing to pay good money to tell us about. Time was when big business wanted to keep its apocalyptic fantasies secret. We keep having power cuts. In eight days, we had three, all of them between 5.30am and 6am, which all lasted most of the morning. I know exactly when they happen, because the smoke alarms start beeping and wake me up. My partner claims she was warmer on a demo than she was in the flat during no.2. As they seem to follow a pattern of happening at the same time every other day – just about when power demand starts to turn back up in earnest – I was wide awake at 0545 today waiting for the plaintive beeps. But no – looking at the chart, the ramp-up is later on a Sunday. Mind you, later in the day the lights flickered repeatedly for half a minute. So I rang up UK Power Networks’ (what used to be EDF Energy Networks, what used to be the London Electricity Board) press office and announced myself as a blogger. And the lights immediately went out…no, actually, they issued the following statement. Holloway Road area of London who have experienced a series of power interruptions over recent weeks. In the latest incident, power was interrupted to 327 customers at 5.54am today and restored to all customers affected by 11.20am. Can it indeed. Let’s hope they don’t end up needing to do one of these. So the government thinks this is clever. They also think it constitutes a “searchable online database”. It is not searchable, nor is it a database. It is a collection of links to department web sites, some of which actually lead to useful documents, some of which lead to utterly pointless intermediary pages, some of which lead to documents in a sensible format, some of which lead to documents in pointlessly wrong formats, and some of which lead to PDF files. It provides no clue how often this data will be released or when or where. The URIs sometimes suggest that they might be predictable, sometimes they are just random alphanumeric sequences. Basically, what he said. Meanwhile, very few of these documents have made it onto data.gov.uk, the government’s data web site (pro-tip: the hint is in the name) which provides all that stuff out of the box. This is not just disappointing – this is actively regressive. Is it official policy to break data.gov.uk? Anyway, I’ve been fiddling with NetworkX, the network-graph library for Python from Los Alamos National Laboratory. Sadly it doesn’t have a method networkx.earth_shattering_kaboom(). I’ve eventually decided that the visualisation paradigm I wanted was looking me in the eye all along – kc claffy‘s Skitter graph, used by CAIDA to map the Internet’s peering architecture. The algorithm is fairly simple – nodes are located in terms of polar coordinates, on a circular chart. In the original, the concept is that you are observing from directly above the north or south pole. This gives you two dimensions – angle, or in other words, how far around the circle you are, and radius, your location on the line from the centre to the edge. claffy et al used the longitude of each Autonomous System’s WHOIS technical contact address for their angles, and the inverse of each node’s linkdegree for the radius. Linkdegree is a metric of how deeply connected any given object in the network is; taking the inverse (i.e 1/linkdegree) meant that the more of it you have, the more central you are. My plan is to define the centre as the prime minister, and to plot the ministries at the distance from him given by the weighting I’d already given them – basically, the prime minister is 1 and the rest are progressively less starting with Treasury and working down – and an arbitrary angle. I’m going to sort them by weight, so that importance falls in a clockwise direction, for purely aesthetic reasons. Then, I’ll plot the lobbies. As they are the unknown factors, they all start with the same, small node weighting. Then add the edges – the links – which will have weights given by the weight of the ministry involved divided by the number of outside participants at that meeting, so a one-on-one is the ideal case. When we come to draw the graph, the lobbies will be plotted with the mean angle of the ministries they have meetings with, and the inverse of their linkdegree, with the node size scaled by its traffic. Traffic in this case basically means how many meetings it had. Therefore, it should be possible to see both how effective the lobbying was, from the node’s position, and how much effort was expended, from its size. The edges will be coloured by date, so as to make change over time visible. If it works, I’ll also provide some time series things – unfortunately, if the release frequency is quarterly, as it may be, this won’t be very useful. Anyway, as always, to-do no.1 is to finish the web scraping – the Internet’s dishes. And think of a snappy name. Coleshill Manor is the headquarters of a variety of Tory organisations, notably the West Midlands Tory party itself and the commercial entity known variously as Constituency Campaigning Services Ltd. or Coleshill Campaigning Services Ltd, which essentially provided the services of the party’s central institutions to individual Conservative Associations against a contribution, organising things like junk mail, phone calls, and other jewels of our society. The purpose of this structure was to render CCS a commercial company in the meaning of the Political Parties, Elections, and Referendums Act – if you gave money to an individual MP’s campaign, who then used it to pay for the services of a political consultancy, you would fall under the provisions of the Act and your donation would be both recorded and limited. If, however, you gave it to a commercial company which then sold its services to the campaign, not so much. Here’s the Other Taxpayers’ Alliance. Various investigations have occurred into Coleshill – notably that the Tories use large amounts of office space there paid for by various millionaires via the companies based in the building. CCS alone received £1m in donations before the 2005 election. There’s also a major call centre there. Rounding it up, we have here part of a political campaign structure designed to accept external donations outside the legal framework, that is plugged into the Whips’ Office at the far end. Neat! Any public inquiry into the activities of the JFIT would be expected to examine the extent to which it was supervised by military lawyers. It is now known that at least some of the training material used by F Branch at Chicksands between 2003 and 2005 escaped the scrutiny of the training centre’s in-house lawyer, Brigadier David Yates, who told the Mousa inquiry that he did not “have the capacity” to check it. Now, we also know that the Americans began with the torture in 2002, and that Major-General Geoffrey Miller was transferred from Guantanamo to Iraq with his infamous directive to “Gitmo-ize” the detention camps in the summer of 2003. So, where did this documentation come from?